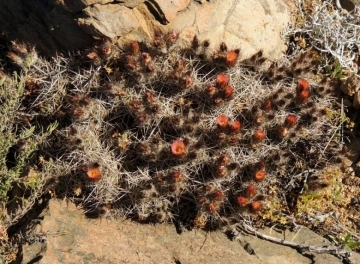 In habitat Neuquén province. Argentina. 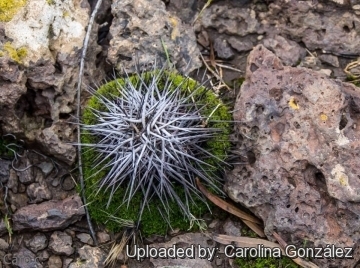 Origin and Habitat: Austrocactus longicarpus is endemic to a small area north and south of Zapala and westward to Primeros Pinos in the the province of Neuquén, Argentina. Altitude range: It grows at elevations of between 1000 and 1400 metres above sea level. 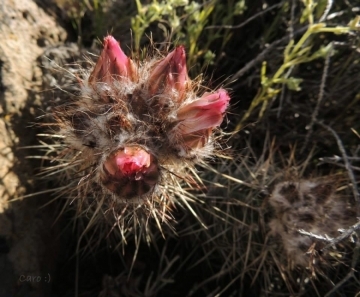 Description: Austrocactus longicarpus is a peculiar species distinguished by very long, narrow fruits that don't open at maturity from a basal pore, but split open by a lateral crack. The flowers are borne near the tips of the stem and show peculiar traits. 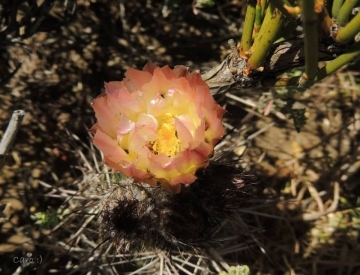 They are narrowly funnel-shaped with pink tepals, while the style and pistil are white or very pale pink, conversely all the other Austrocactus with pink flowers always have a purple style and pistil (occasionally flowers takes a honey yellow colouration). The spines are also very impressive, dense, stout, sword-shaped, curved or straight, amber to brown, sometimes reddish. 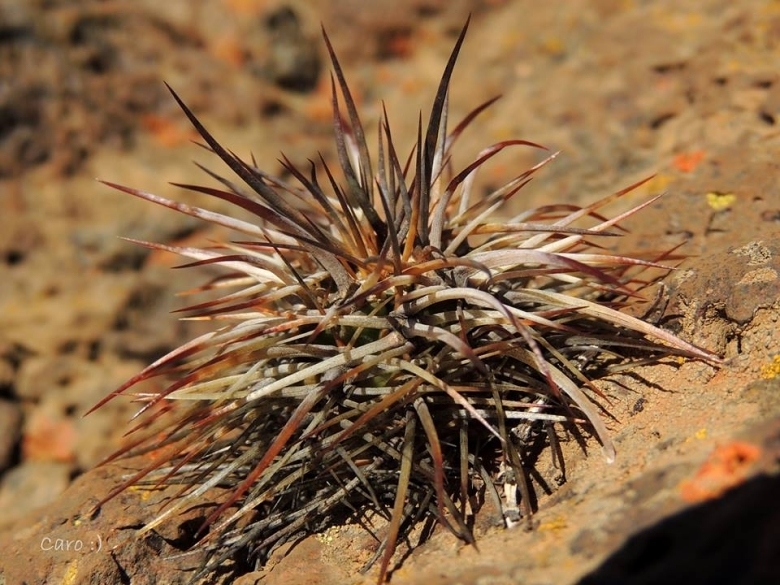 The plants found in the upper part of the range (1400 m a.s.l.) often shows darker epidermis and spines, but all other features are the same. 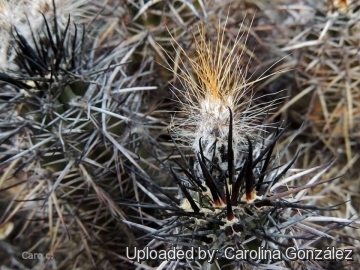 1) Elisabeth Sarnes, Norbert Sarnes "Anmerkungen zu Austrocactus coxii und Neubeschreibung des Austrocactus longicarpus." In: Kakteen und andere Sukkulenten. Volume 65, Number 10, 2014, pages 253–261. Cultivation and Propagation: Austrocacti are relatively easy to grow, providing they are kept cold, but dry during autumn and winter. However difficult to find high quality plants of this species in cultivation. 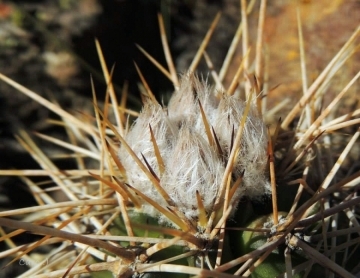 They are very cold hardy cacti theoretically hardy to -18°C (or more) particularly when dry. 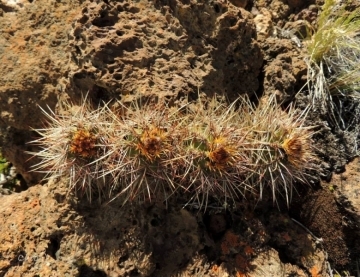 These cacti are often grown grafted. Plants cultivated outdoors are drought tolerant and take full sun. 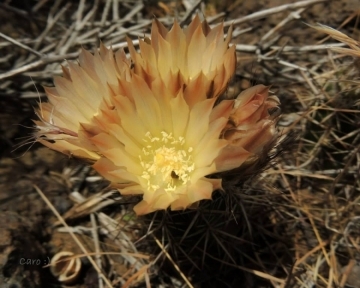 They are wonderful companion plant for Echinocereus and Escobaria cacti species. Exposition: It is essential to give full sun otherwise they will become atypical. If grown in full sun, the new growth will flower in spring and summer.